What's the baby up to? to you and other familiar people. She recognises your face and scent. through the gum as most people think. It's a natural process which occurs gradually, often with few or no problems. and doesn't injure the gums. Make sure your baby is drinking lots of fluids as babies can often become dehydrated. 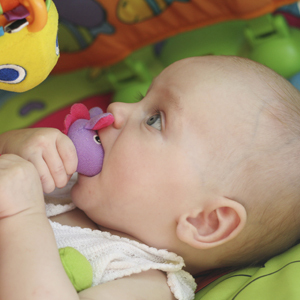 Oral teething gel can help ease teething discomfort as it numbs the gum for a short time. Remember to check with your pediatrician before giving your baby any medication. The lower front central teeth (incisors) are usually the first to poke their way through the gum. Upper front central teeth (incisors) are seen. The first primary molars make their appearance. The canines appear next to the incisors. Go back to the complete list of Baby week-by-week updates.